Union Pacific installed Positive Train Control (PTC) equipment on 100 percent of required route miles and implemented on all required passenger train routes. Implementation efforts continue to ensure PTC interoperability with other freight and passenger railroads operating on Union Pacific tracks by 2020, as allowed by federal law. 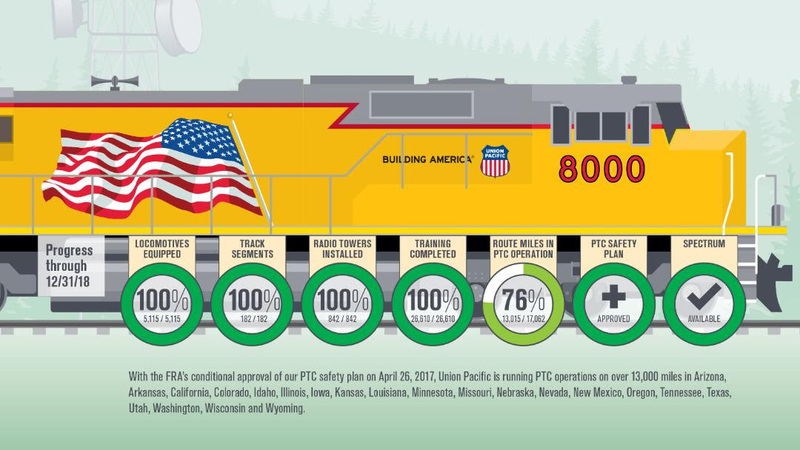 With the FRA’s conditional approval of Union Pacific’s PTC safety plan on April 26, 2017, Union Pacific is running PTC operations on more than 13,000 miles in Arizona, Arkansas, California, Colorado, Idaho, Illinois, Iowa, Kansas, Louisiana, Minnesota, Missouri, Nebraska, Nevada, New Mexico, Oregon, Tennessee, Texas, Utah, Washington, Wisconsin and Wyoming. Union Pacific and freight and passenger railroads continue working together to safely implement PTC on the remaining 4,000 required route miles.